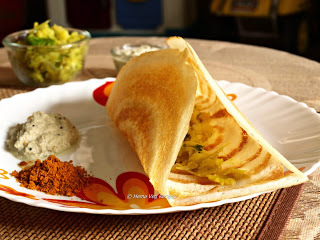 In Southern part of India, people usually prepare varieties of Dosa, like Urad dal Dosa, Rava Dosa, Raagi Dosa, Masala Dosa, Neer Dosa, Onion Dosa and also the Set Dosa. In many hotels we get these varieties of Dosas except for Neer Dosa which is available in very few. 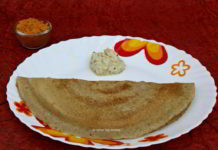 We usually prepare Neer Dosa at home. When I visit hotels, I always love to eat Set Dosa, as it has less oil in it. The sponginess of the Set Dosa always attracts me. It is served with simple coconut chutney and Bombay Saagu. It taste simply good. I learnt this from my aunt. She adds chopped Onion and chopped Coriander Leaves as toppings. But I love to eat this simple spongy dosa with Chutney. We do not use Urad Dal in this recipe. The sponginess comes by adding Thick Poha and Curd or Butter Milk. If you are grinding at night, wash and soak the Rice and Fenugreek Seeds in water and Poha in Curd or Buttermilk for 2 to 3 hours. Grind and then transfer the batter to a big vessel and keep for fermentation overnight. If you want to grind in the morning, wash and soak everything mixed with Curd plus Water overnight. Next morning grind it and keep for fermentation for at least 2 to 3 hours before preparing Dosa to get the sponginess and pores in Dosa. 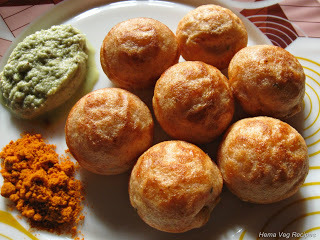 So in these two ways we can prepare this Dosa batter. Some people add Cooking Soda while grinding in the morning and use it immediately. But I don’t prefer it. In one bowl wash and soak the Dosa Rice and Fenugreek Seeds in water. In another bowl wash Thick Beaten Rice or Poha and soak in Curd separately. Soak for 2 to 3 hours. After 3 hours, transfer all the above soaked ingredients together with Salt to a mixer jar and grind in a mixer grinder to a smooth batter. Do not add more water while grinding as the batter turns watery once it is fermented. Grind till the Rice turns to a smooth batter, then transfer to a bigger vessel and place a plate on it. Keep the batter un-touched for at least 8 hours or overnight. OR You can wash and soak all the ingredients except Salt in a bowl overnight with little curd mixed with sufficient water. 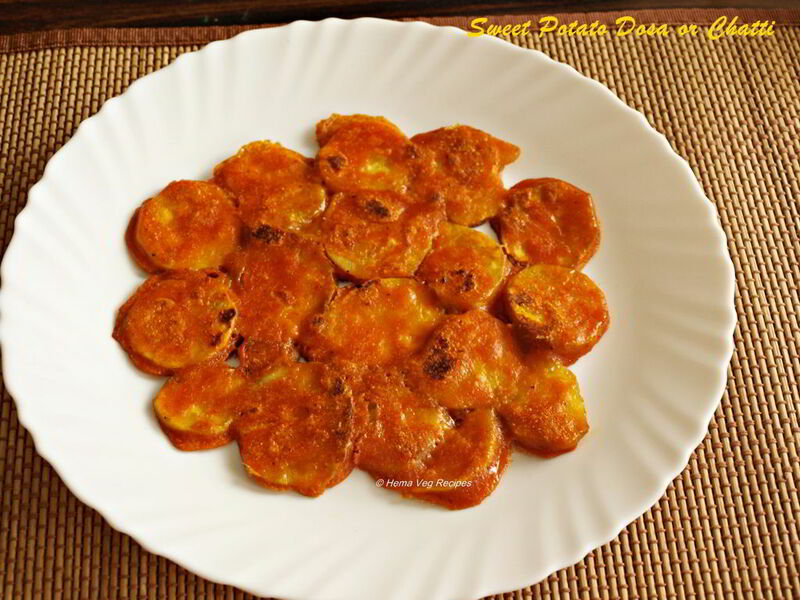 Grind it in a mixer grinder in the morning and keep for at least 2 hours before preparing the Set Dosa. 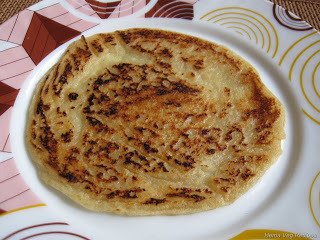 If you find the batter is not well fermented you can add 1/4 tsp of Soda before preparing the Dosa. Now the batter is fermented and turns little watery. Mix well with the help of a ladle before preparing the Set Dosa or Sponge Dosa. Preheat the Dosa Tawa for about a minute. Pour a ladle full of Set Dosa Batter and drizzle Oil on it. Do not spread the batter. Pores starts to appear, now cover it with a lid and cook over a medium flame for about a minute. 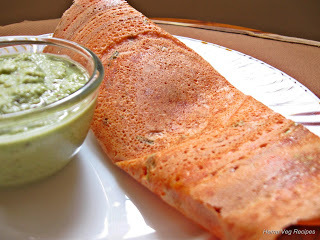 If you want the Dosa to be brown on both the sides, turn the Dosa by turning other side and cook it for a minute. Then transfer it to a serving plate. Now the Dosa is ready to be served. Likewise make 3 dosas which makes a Set. 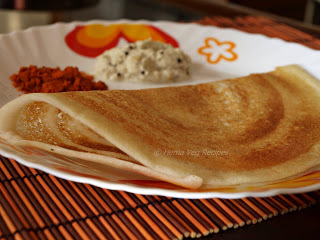 Serve this Set Dosa [Sponge Dosa] with Coconut Chutney or Bombay Saagu. Always try to grind the batter as thick as possible, as the batter turns watery once it is fermented. Dosa will not become thick and tasty without pores in it. Do not add more curd while soaking. You can also use thick Buttermilk if curd is not available. You can get better Dosa with sour Curd or Buttermilk. When you are grinding in the evening and keeping the batter overnight make sure not to soak all the ingredients in curd. Dosa becomes sour if more curd is used. If you want to store the left over batter in a refrigerator, keep it in a big vessel, so as to give more space for the batter to ferment and avoid spilling inside the fridge. Please let me know wha is dosa rice means? Sorry for the late reply Angela. Dosa Rice is little thicker than the normal Sona Masoori and it cost lesser than other Rice. It gives good taste and texture to the Dosa.